LeapFrog Number Lovin' Oven Just $15 Down From $25! You are here: Home / Great Deals / Amazon Deals / LeapFrog Number Lovin’ Oven Just $15 Down From $25! LeapFrog Number Lovin’ Oven Just $15 Down From $25! Check out this fun Amazon deal. 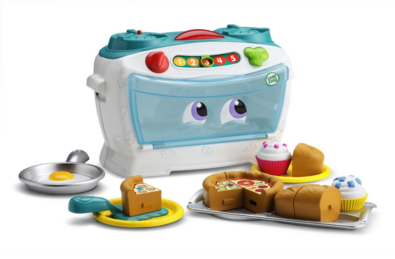 LeapFrog Number Lovin’ Oven is just $15 down from $25! Get yours now while it lasts! The perfect recipe for number learning fun, with 16 toy pieces included. Over 30 phrases and songs warm up counting, sharing and fraction skills. Move the number slider to explore numbers, time and temperature, count along with the blinking light and more. Teaches Counting, Parts of a Whole, Sharing.